Google Photos' decoupling from Google+ dates back to May, which means five months have now passed since. In this time, Google Photos has received several updates and gained essential features like Chromecast support and albums for adding and reordering images. Now the Photos team is ready to reflect on these five months and share with us a few stats about the app and service's use. Photos now counts 100 Million active monthly users, but how that number is tallied I couldn't tell you. Does a single search or view count, or did they require uploads for users to be marked as active? I'm not sure. 15 Million animations and collages have been created, either manually or through Assistant. And 3720 Terabytes of storage have been cleared on phones thanks to the backup option. When it comes to the photos uploaded, apparently the first most photographed thing is food and the second is cars. Skies, mountains, and beaches are all in the top 10. Dogs dominate other animals and babies dominate searches. Paris, New York, and Barcelona are the most popular places, and weddings, concerts, and Christmas are the most captured moments. We're all quite vain too, since the search for "me" or "selfie" is very popular. How popular? 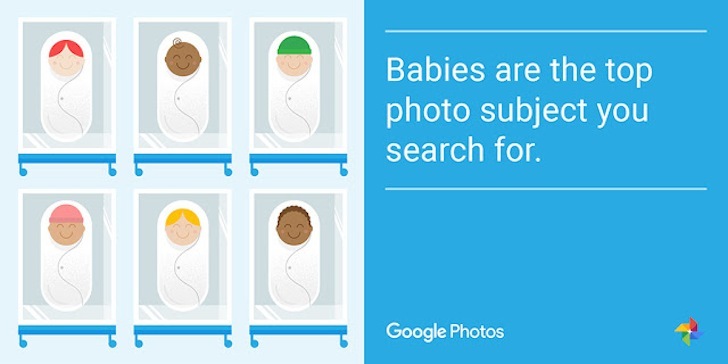 Not as much as babies, but the team doesn't specify where exactly it lands in the top keyword searches. Make sure you check the Photos' team original article to see all the cool gifs they created for each stat and learn a few more tips to make the best of the app and service.